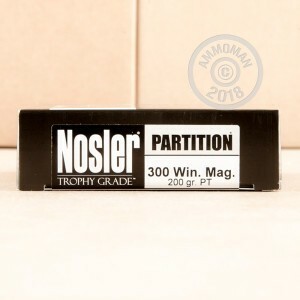 Big bears, enormous elk, and large deer will all be downed in your sights when you touch off one of these excellent .300 Winchester Magnum cartridges from Nosler's Trophy Grade line-up. 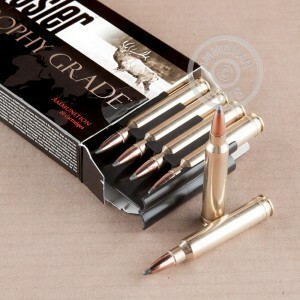 Nosler, an Oregon based conglomerate, is widely known for their production of quality projectiles as well as their versatile range of finished ammunition. With a focus on hunting, Nosler has won multiple awards for their weapons and ammo and is always recognized by hunters and handloaders alike as a trusted brand. These rounds utilize a 200 grain bullet with a copper jacket that covers all but the exposed soft lead tip which will cause the bullet to expand on impact and produce a devastating wound channel. This mushrooming expansion is assisted by the jacket being thinner up front as well as a partition in the middle which separates the center of the bullet into two lead cores; the rearmost retains its weight impact and prevents jacket separation while preserving momentum. Nosler maintains some of the tightest quality control around and inspects every dimension of these reloadable brass casings down to the diameter of the flash hole. These rounds leave the muzzle at 2,750 feet per second with 3,357 foot-pounds of energy. When zeroed at 200 yards, these rounds can shoot very flatly and only rise about 2 inches at 100 yards and then continue to deliver up to 2,520 foot-pounds of energy at 200 yards.